There was no doubt in my mind that for this month's SRC post I would be delivering something Thanksgiving-worthy. 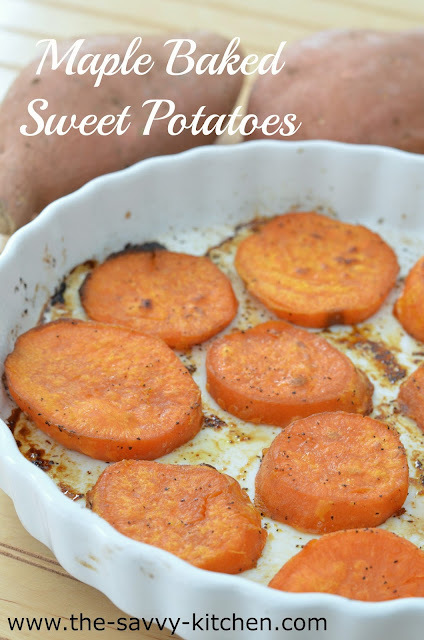 Margaret's blog, Tea and Scones, had a ton of options to choose from, but this sweet potato recipe won me over. I really only needed two ingredients (plus a few pantry essential items) and it was really easy to put together. And seeing that I'm due a little over a week after Thanksgiving, I wanted something quick, simple and delicious that I could make without wearing myself out! We really, really enjoyed this side dish and I'm certain I'll be making it again, Thanksgiving or not. Enjoy! In a large saucepan, cover the sweet potato slices with water and bring to a boil. Reduce the heat to medium and cook until just tender, about 5 minutes. Drain well. 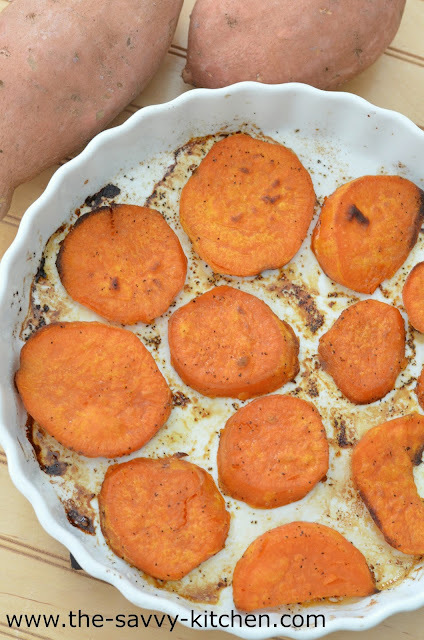 Arrange the sweet potatoes in a large gratin dish. Season with the salt and pepper, then dot with the butter pieces. Drizzle the maple syrup over the sweet potatoes, sprinkle with the water and bake for 15 minutes. Turn the sweet potatoes over and bake for about 25 minutes longer, until they're tender and lightly browned. Once done, turn on the broiler and broil for 1-2 minutes, until golden brown. I love this! So simple and easy, the perfect side dish for a busy Thanksgiving day. This will definitely be making an appearance on our table this year. Thanks so much for sharing! I've made a mashed sweet potato recipe using these same ingredients, and it was delicious. I'm looking forward to trying it this way. Congrats on your upcoming new baby too! These sound fantastic! I can’t wait to try them.